Whole-language approaches to literacy-teaching generally include two-syllable words in the first handful of words children are expected to rote-learn. For example, "away", "funny", "little" and "yellow" are all in the "Pre-primer" Dolch words. Analytic phonics approaches also present beginners with many words of more than one syllable – A is for aardvark, abacus, above, acorn, actor, adult, aeroplane, almond, August, Australia…ten words starting with seven different sounds. These are both good ways to overload beginners and confuse them about sound-letter relationships. There's quite enough complexity in the spelling patterns of English one-syllable words to keep beginners very busy, without adding all the extra patterns that appear in longer words, like the "y" in funny, the "le" in little, the "aer" in aeroplane, the two different "au"s in "August" and "Australia", and the biggest spelling hurdle in longer words, the unstressed vowel. 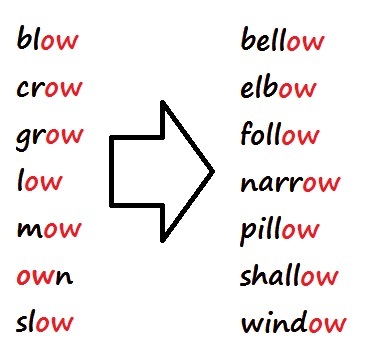 In many words with more than one syllable, one or more of the spoken vowels/syllables is typically produced without stress, as the unstressed or weak vowel. In linguistics this vowel is called schwa. Schwa is kind of like a little grunt, a very short "uh" sound. It's the final syllable in the spoken words sofa, butter, actor, dollar, tapir, thorough, cheetah, colour, centre, murmur, nature and martyr. It's the first syllable in above, elect, aesthetic, oesophagus and Olympics. And it's a poor neglected middle syllable, spelt using just about any vowel spelling, in thousands and thousands of words. Most multisyllable words are typically pronounced with at least one schwa sound – it's the "a" and "e" in "apartment", both "e"s in "evangelist", the "o" and the first "u" in "circumlocution" and the "i" in "magnanimous". It speeds words up and helps give our language its rhythm. Bootstrap "butter", "flower" and "waiter" with "er" from "fern", "her" and "term"
Before beginners study words with more than one syllable, they should first learn the basic spelling patterns in one-syllable words – for example the er in "her" and "term", the ar in "car" and "farm" and the or in "for" and "cord". Once they have mastered all these, they can apply this sound knowledge in the opposite direction, to help them remember the spellings of longer words – by saying and rememberbing "angER", "mattER", "showER", "liAR", "mortAR", "solAR", "actOR", "motOR" and "sponsOR". If they tackle such words before they have a good grasp of "er" as a spelling, they're more likely to say actUH, motUH, sponsUH and tractUH, and not know how to make sense of these words' spellings or file them in their heads in an organised way. When writing in front of children (or older literacy-learners) – whether it's a shopping list, therapy notes or a text message – I try to always sound the words out aloud, because that's what I require them to do. I don't want to be a "do as I say, not as I do" person, plus my sounding-out helps reinforce the idea of spelling as a sound-letter exercise, not just an exercise in regurgitating memorised words holus-bolus. If learners are saying every sound as they write, and they know the basic vowel spellings from having practiced them in little words, they can then say and retain unstressed vowels as they are spelt, which is what good spellers seem to unconsciously do. If you ask a good speller what the last sound in "chapter" is, they'll generally say "ER" as in "deter". But if you listen to them having a conversation about chapters, they won't actually be saying "chaptER", they'll say it more like "chaptUH", as we all do, because the last syllable in this word is unstressed. If you ask a preschooler, illiterate person or a very poor speller what the last sound in "chapter" is, they're more likely to say "UH". Which is more or less correct if we're just talking about sounds, but doesn't help with spelling. Saying long words as they are spelt is also a good strategy for learning to spell long and hard words. Once you start asking good spellers how they do it (as I have been) you find many of them who mentally say "bus-i-ness" when writing the word "business" and "di-a-phrag-m" when writing "diaphragm". That is, they say words with tricky spellings a funny way, to help them remember the spelling. Even Oxbridge scholars do this, if the French soldier calling Arthur's companions "Kerniggets" in Monty Python's French Taunting scene is anything to go by. The Pythons also had a wonderful time with spelling in the Life Of Brian and the Raymond Luxury Yacht sketch. More evidence that spelling can be interesting and fun. This entry was posted in blending and segmenting, consonants, sound-letter links, sounds, spellings, syllables, teaching strategies, vowels on January 9, 2013 by alison.